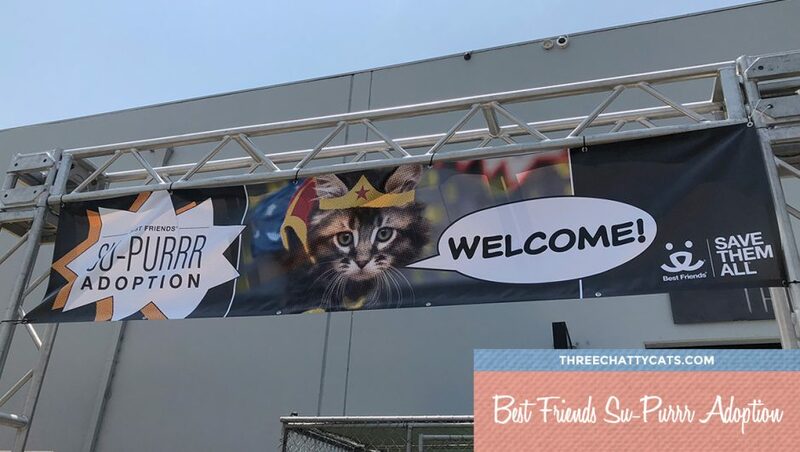 This past weekend, Ross and I volunteered at the Best Friends Su-Purrr Adoption event in Los Angeles. It was the group’s first ever cat and kitten focused event. 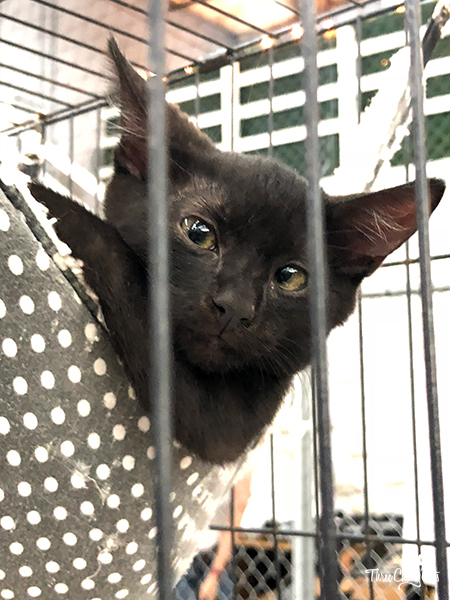 Best Friends hosted several NKLA Coalition Partners (rescue groups in Southern California who are part of the No-Kill Los Angeles initiative) and over 300 cats and kittens were available for adoption. I haven’t heard the final adoption numbers yet, but while volunteering, I saw lots of people leaving with cats in carriers! It looked promising! The kittens inside the Catty Wagon had lots of visitors. When I left the event on the first day, half of them had already been adopted! Once inside, the public had plenty of cats and kittens to choose from, like these ones. One of the rescue groups I’ve featured before on the blog, Peter Zippi Memorial Fund, was at the event along with several others – like this group (that I’d never heard of before) with an awesome name and logo! Kitt Crusaders! But let’s get back to the cats. Like this chill fella just hanging out. Both my mom and a friend said he looks like a monkey. He’s definitely a cutie! Previous Chatty Cats: Attacks, Toots and More! Next Chatty Cats: Smiles, Secrets and More! 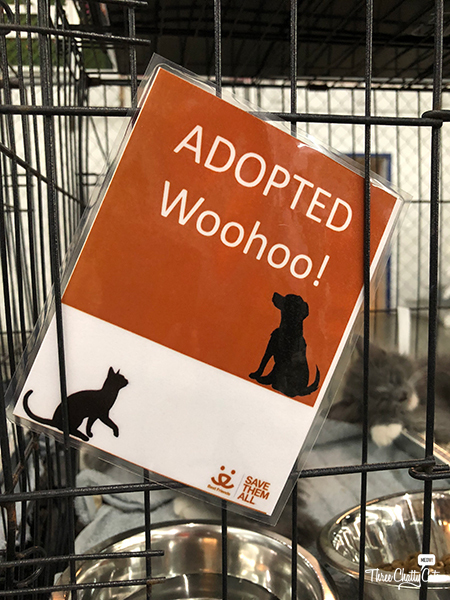 My FAVORITE word at an adoption event…………….”ADOPTED!!!! !”………..happy for all those who found a home and hugs of hope to all who are still looking. Sounds like a great event and we so hope lots of kitties found new homes. I love happy endings and this event had a lot of them! Awe i like that catty wagon! Looks like the event was a success and so glad many were adopted. Now, I wonder what the Three Chatty Cats (+2) thought when the human returned with the scent of strange kitties! OH! How fantabulous! So, what did you two actually do as volunteers? 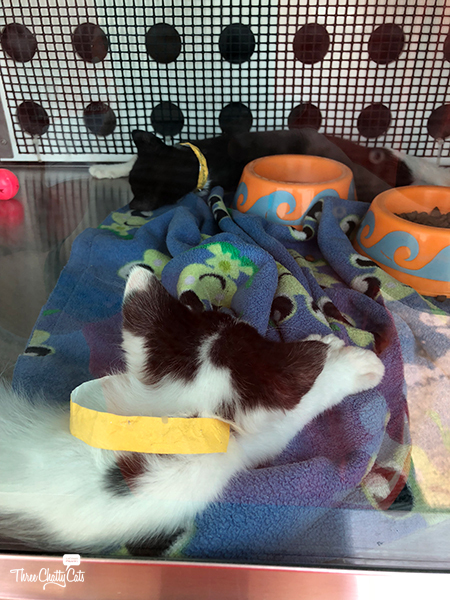 Direct people, hand out flyers, clean cages, or stand there like Vanna White, “Look at these kitties! So cute, no?” I happen to excel at the Vanna White job; I have her hand gestures down, and smile like my life depends on it! Ross and I were Event Greeters. So although the event was inside, we were actually stationed outside the front entrance. It was hot but we were supplied with plenty of water and shade. And being outside allowed me to see how many people were leaving with newly adopted cats! You just can’t have too many adoptions and those sweeties sure deserve it! What a fun event! We sure hope lots of adoptions happened. What a fun event!!! And that Catty Wagon is too adorable for words! How kind of you to volunteer. Such sweet faces, I hope they all got forever homes. What a terrific event! Especially the part about lots if cats being adopted! Sounds like it was a great event. I would have wanted to adopt everyone! My house is “full” (4 cats, each with personality disorders) but I’m still keeping my eyes open for an all black male with fangs and some kind of special needs. I think I got a subliminal message from your cats. :) As soon as I opened this post, it immediately transferred over to a picture of Sophie. Have your cats been telling you “no new siblings”?